Sri Lanka was once called Ceylon, and the name still holds for one it’s a major exports: tea. 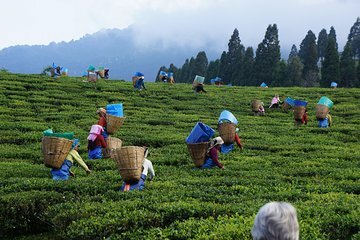 With this tour, skip passive vacation pastimes for a tea plucking experience on a plantation. Get on the field with estate workers, grab the necessary tools, and spend some time picking tea leaves. You’ll also witness all aspects of the tea-making process on a guided tour of a tea factory. Driver and guide were very helpful, however you can get the tour far, far cheaper booking directly. The picking was only LKR1,000 each if paid directly 7USD. I wouldn't book this trip through Viator again.